Mark Baxter has also written The Fashion of Football, which he co-wrote with Paolo Hewitt, and which was voted as one of fifty top football books of all time by the magazine 442. Paolo Hewitt is best known as a music journalist and he worked for Melody Maker and NME during the 1980s. Excellent read hightly recommended outstanding! Not actually a book about a horse. More the life of a young man, giving an insight into his relationships with family and friends. The social context is fascinating, in all its honesty. I loved the film, but the book is infinitely better. Absolutely first class. It makes a change to read a book that takes you back to the good old days of having a crack with the boys! Can't wait until Bax hits us again with another. inspiring, emotional, funny with a brilliant twist... its a great read and you know its a great book because you want to talk to people about it during and after. A cracking read! Both happy and sad with great characters and real attention to detail! A feel good read!! Marvellous read....congrats to Bax & Paolo for capturing a time so enthrallingly. Can't wait to see the big screen adaptation....hope it does the book justice! A book about real people, with great chracaters with great humor ! Well written and well deserving of my vote! A great book thoroughly recommended; many poignant moments throughout this book including certain events in the 80s that few remember but many would do well to learn from especially in these trying times. One of the rare books that deserve to be made into a movie and with Bob Hoskins at the helm it sounds set to be a right cracker! Top Book! And very much looking forward to the big screen version. Well done Mark & Paolo from Iain in Edinburgh. Couldn't put this book down,thoroughly recommend it,so good it's being made into a film "outside bet" starring bob hoskins among others. Good read. Moving story, can't wait to see the film Outside Bet in April. I really enjoyed this book, thoroughly recommended. Looking forward to seeing the film! I got my first copy of The Mumper a few years back and still its one of my fav! Great read! 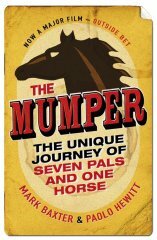 I read The Mumper and enjoyed it so much that I gave copies to friends and family for birthday and christmas presents. Fab book. Did not realise it is being made into a film? When? Fantastic book. Made me laugh and cry in equeal measures. Can not wait to see the film. Hearftfelt, warm, and funny London horse caper,like an Ealing comedy relocated to Walworth. Truly well written and amazing story, I couldn't put the book down once I started reading I was intrigued to keep reading. Great story set against turbulent times - brings back many memories. Best book I've read in ages! Lovely. Deserves to win without a doubt - go The Mumper! A cracking, at times moving read. A cover-to-cover joy! Get on it! What a great book, thoroughly recommend ! Simply brilliant. An excellent read. Brilliant read... Laughed and cried! A great read that takes you right into the heart of SE London and its people. Brilliant book. Defiantly worth a read. A very satisfying read. LOVED it. A real roller coaster ride of a wonderful read, sad and very funny. Great characters and real slice of London life in the 1980s.Highly recommended.